Griffin Ukuleles is really a one man band. Just one old guy who loves woodworking and discovered the joy of the ukulele pretty late in life. Twenty five years ago I retired from a long career as an insurance broker and promised myself that I would spend the rest of my days creating beautiful things . I have kept that promise and have spent the ensuing years painting, carving, writing local history books, and creating whatever satisfied my artistic and aesthetic sense. A few years back I discovered the ukulele and my fascination and obsession began. After I had made a few, and joined the local ukulele society B.U.G. (Bellingham Ukulele Group) the word got around and people began to ask if they could buy one of my ukuleles. Since I could not seem to resist making them, and because my workshop ceiling rack began filling up, selling them seemed to be the only reasonable thing to do. Now word of mouth has begun to tell the ukulele world of my instruments, Perhaps the reach of this website will allow me to continue this passion of building ukuleles and keep the number on workshop rack at a manageable size. A few years ago my grandson Evan Christie and I collaborated on designing a new travel ukulele. It is unique in that its oval shaped back is hand carved from a beautiful piece of curly maple and its concave interior gives these charming instruments, made in either soprano or concert size, simply amazing volume and tone. We had some of them made in Mexico and while the quality was good, the reliability of production has been disappointing. The Mexican ukes have all been sold and for now the only production of them will be my own. As much as I love these pinecones, most of the instruments that I make are standard tenors. 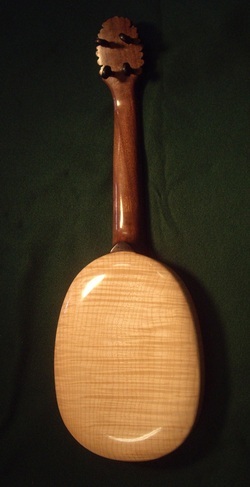 I am fascinated with the differing tonal results that one gets with different woods. Building ukuleles is a labor of love for me, and since I am long retired, it is really a hobby that pays for itself when I sell the surplus. I make only about ten a year and I have decided to not make custom instruments for others but to make what interests me. I have decided to lower my prices and build to pleasure myself hoping that what I like others will like. This should eliminate the stress of time pressure and expectation when building custom ukes for others. I enjoy photographing my work and sharing it throughout the blog so I hope you will check in once in a while and find it interesting. I also have a healthy supply of Aurora Strings, lots of excellent wood to share with other builders , and other miscellanea that I will be offering for sale on the website . thanks for looking at Griffin Ukuleles. A few months ago I began to plan my 100th ukulele. I thought it would be fun and proper to try something new for such a milestone. 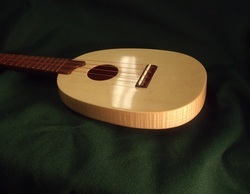 I had been impressed by the Kasha ukuleles built by Eric Devine on Maui, and upon learning that Mike and Asa Chock at Hana Lima Ai sold a plan for a Kasha tenor, I ordered it. Wow, my 100th uke became my very best. I am now a convert to the Kasha bracing system. I have built an additional 15 ukes, all Kasha's and am now hard at work building #116. Several months ago I enjoyed the great thrill of receiving a commission from that amazing musician Stuart Fuchs. He loved the sound of #100 and ordered one just like it. You can see him playing it on Ukulele Zen. 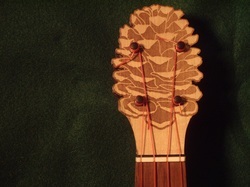 I am not saying I will never build another fan braced uke, but I truly believe that the Kasha instrument to be better. I have now also built three Kasha baritones and they are spectacular. You are likely to see me concentrate on Kasha's and Pinecones.